What, they're not made of organic hemp? Apple is a grubby polluter and isn't doing enough to change that, according to environmental pressure group Greenpeace. A new campaign comes on the back of a Greenpeace investigation into the contents and destination of hardware which ranked Apple below less hippyish brands like Dell and HP for environmental responsibility. Greenpeace says it has been in direct talks with Apple representatives for two years aimed at getting toxic chemicals like PVC removed from its products, to no avail. Apple repeatedly refused to commit or asked for more time, a spokeswoman told The Register . The new MacBook range contains compounds on Greenpeace and EU lists as priority toxins that should be removed from electronics manufacturing. The "greener Apples" push is here, complete with Apple-style page design. 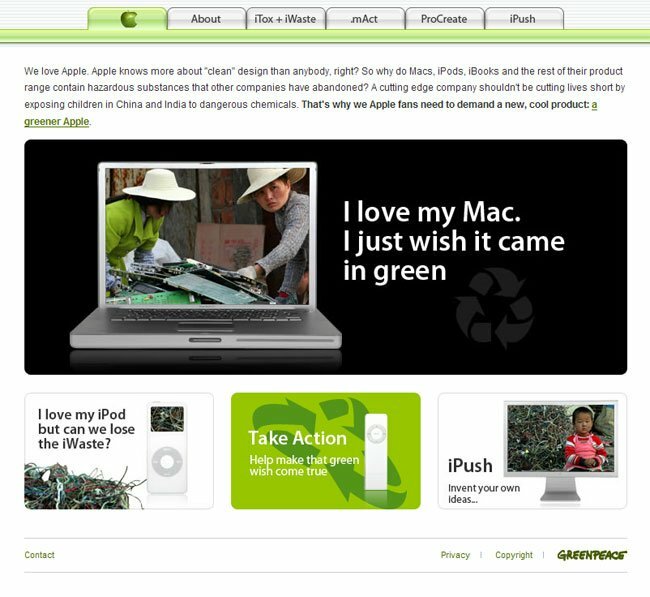 Greenpeace accuses Apple of not trying hard enough on environmental concerns, claiming its products are needlessly toxic, don't last long enough, and they end up in developing world landfill sites. It's a message that Greenpeace hopes will resonate with Apple's lifestyle-hip audience. There's various ways on the campaign site to demonstrate displeasure with Apple's allegedly dirty ways. Apple refused to comment today. But Greenpeace's anti-Apple vocalisations have some Mac acolytes getting all defensive. San Francisco blogger Daniel Eran published a lengthy rebuttal of the original Greenpeace report here. He claims Greenpeace used "sloppy and incompetent" methods in compiling it. His biggest advertiser (guess who?) will be pleased. The greener Apples site makes for touching reading, in fact. Greenpeace were themselves clearly very upset to discover their Apple gear wasn't as right-on as they'd been led to believe. Only one man can save the planet from Apple, according to Greenpeace, and that's... er... Apple CEO Steve Jobs. Greener Apples implores the northern Californian high witch to drive his hybrid-engined battle tank into the fray and clear their consciences. It says: "We're not asking for just 'good enough'. We want Apple to do that 'amaze us' thing that Steve does at MacWorld." Being concerned citizens of planet Earth, greener Apples genuinely has our whole-hearted support.